Take any two athletes, both with the same ability, and pit them against each other. The one with the better technique and body mechanics is gonna win. Why? Because his movement is more fluid and efficient than the athlete whose technique and mechanics are poor. The technically sound athlete has less wasted movement, greater leverage, and therefore more power behind his movement. This also applies to sprinting. 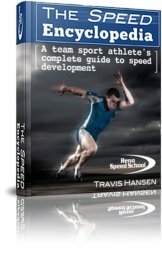 Great sprinting technique and mechanics will eliminate wasted movement and increase your speed. When you sprint, you want to keep your arms in tight. Your arms should stay at a 90-degree angle, swinging at the shoulder, but never at the elbow. Swinging at the elbow is an energy wasting movement and slows you down. Your elbows, meanwhile, should go as far back as efficiently possible before swinging them forward again. On the upswing, you should bring your fist up no further than your lips. Using this range of motion in your arms helps you use the whole range of motion in your stride. You can practice your sprinting technique in the mirror at home or at the gym. Holding light dumbbells (1-5lbs) and pumping as fast as you can while keeping your core tight will help you to improve your arm swing. Leg turnover consists of two phases: the contact phase and the recovery phase. Here are some turnover guidelines to follow and test yourself against when speed training. Your contact phase, or when your feet make contact with the ground, is probably the most important part of sprinting because this is where your legs pull you forward. Contact should occur directly beneath or slightly in front of the hips when in a full sprint. You should run on the balls of your feet. The recovery phase occurs when your leg is cycling through the air. Your recovery leg should come up parallel to the ground. Your foot should be cocked upward (or dorsiflexed), ready to make contact with the ground. Eccentric hamstring strength is very important during the end of the recovery phase, when your hamstring begins to slow the extension of the leg and bring it back down into the ground. If your hammies are weak your legs will extend out further than they should, and end up contacting the ground way in front, instead of slighlty in front of or beneath your hips. This increases the time of your recovery phase, which decreases your turnover rate and makes you slower. So strengthening your hamstrings will help the end of your recovery phase; high knee exercises, and core and hip flexor strengthening will help in getting your knees up, improving your running mecanics. So, to recap, you know that speed is a function of two variables: your stride rate and your stride frequency. A third variable, your speed training program, is what you do to increase the first two. Stride length is harder to increase than stride rate because you leg length and body height is basically set. and by improving your sprinting technique and mechanics. Stride frequency is more trainable and can be increased through power training.